So, I am definitely failing at my numeric GoodReads goal I set. But instead of seeing it as a failure, let's look at it as a possibility. I recently read a post on Book Riot: On Abandoning My Reading Goal and it struck such a chord with me. I do a pretty good job of reading as much as I can. It's no longer feasible for me to concentrate on hitting a certain number of books read. So let's see how I can read better next year. I want to read more books by Sherman Alexie. I listened to the audiobook of his gut-wrenching memoir You Don't Have to Say You Love Me this year, and it left me wanting to explore more of his works. (Yes, I love Part-Time Indian, too!) So part of my Reading Better goals for next year will be to read backlist by new favorite authors. I want to reread one of my favorite YA books of all time: A Northern Light by Jennifer Donnelly. I've been telling myself all year that I would devote time to rereading it, but I don't really let myself reread books unless I have to for a column or post. So part of my goals will be to reread. I've been doing some freelance work this year and the extra income has made me feel more free about buying books, so I want to tackle that to-read shelf and read all the books I have bought lately. This includes my Book of the Month books, which is such a fun service. I've also stepped into a new role at my job, so part of my reading goals this year needs to be about expanding my reading in adult genres. We've been doing Reading Wildly to expand our genre knowledge with our Youth Services staff at the library for a number of years. Eventually I'd like to get something going for all staff, but I have to see how it will be feasible with our staff restructure and our new staff schedule. I know that I personally need to explore some new genres, so that will be part of my reading next year. I have lots of possible ways to "read better" next year. 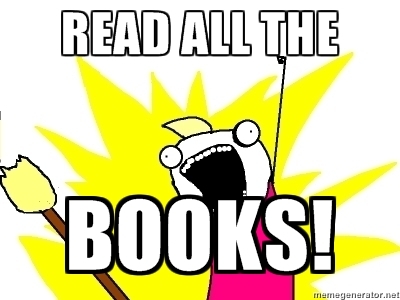 Tell me about your reading goals (if you set any) and how they're coming along. What ways would you like to read better next year?